Capture of the cetaceans is banned internationally! In Japan, illegal trade of wild animals is rampant. On May 16, LIA submitted written demands, along with the concerns of civilians and animal welfare groups, to the Minister of Agriculture, Forestry and Fisheries regarding the treatment of animals in the area around the Fukushima Daiichi nuclear plant. 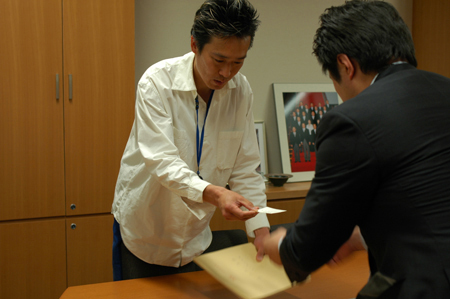 The Executive Director of LIA submitted written demands regarding the treatment of animals in the 20km ‘no-go zone’ in Fukushima Prefecture, civilian comments collected by us on SNS communities and lists of foreign animal welfare groups which approved of our written demands, to the office of Michihiko Kano, Minister of Agriculture, Forestry and Fisheries, at Daiichi-members’ office building for the members of the House of Representatives (Nagatacho, Tokyo, Japan) on May 16. Mr Kano was in the meeting for diet deliberations about animals’ treatment and transportation in 20km ‘no-go zone’ in Fukushima Prefecture at the time, but we met the policy secretary Kimihiro Yoshimura and submitted these documents as a confidential letter to Mr Kano. Mr Yoshimura and we discussed shelters and firm sanctuaries for the animals for more than 30 minutes and shared each other’s thoughts on their lives. Although we met Prime Minister Naoto Kan, Mari Kaieda, Ryu Matumoto, the meeting was much better because Mr Yoshimura and the secretary have fascinating personalities. He promised he would pass our views on to Mr Kano. We collected comments of support from more than 120 people via our website. We sincerely offer our heartfelt thanks for your help.